Building inspection was performed by building engineers in the homes of 400 children who were followed up with questionnaires from birth to the age of 18 months. Specific immunoglobulin E levels were measured at the age of 1 year. 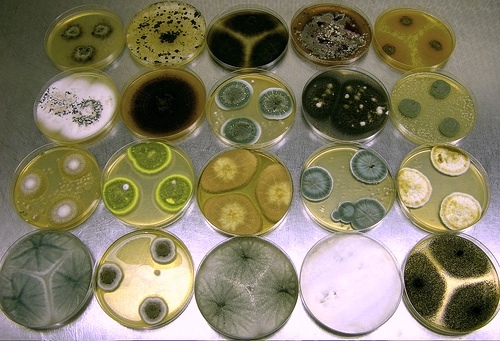 Various fungi including Penicillium and Aspergillus spp. growing in culture. Image source: Wikipedia, University of Sydney, Australia, Creative Commons Attribution ShareAlike 2.5 License. Doctor-diagnosed wheezing was associated with the severity of moisture damage in the kitchen and with visible mold in the main living area and especially in the bedroom of the child. The risk for parent-reported wheezing apart from cold increased with the severity of moisture damage in the kitchen. Moisture damage in the bathrooms or other interior spaces had no significant association with wheezing. This birth-cohort study supports previous observations that moisture mold problems in the kitchen and in the main living area increase the risk for wheezing in early childhood. Confirmed Moisture Damage at Home, Respiratory Symptoms and Atopy in Early Life: A Birth-Cohort Study. PEDIATRICS Vol. 124 No. 2 August 2009, pp. e329-e338 (doi:10.1542/peds.2008-1590). Exposure to visible mold and/or dampness during first 2 years of life associated with asthma risk - but odds ration (OR) was very close to 1.0. Allergy, 2011.